Mount Semeru Bromo Ijen Volcano Tour Trekking 6 Days 5 Nights. East java volcano tour with combinations trekking trip to the highest semeru mountain on the island of Java,camping at ranu kumbolo,adventure by jeep 4WD in mount bromo and climb to ijen crater in East of Java for 6 days 5 nights with meeting point journey from surabaya airport . Semeru Bromo Ijen Crater Tour Package 6 Days 5 Nights, Mount Semeru in the highest mountain in Java island, the best destinations for trekking and hiking in east java.Mount Semeru in the area of Bromo Tengger Semeru National Park, one region with tourism objetc of Mount Bromo. 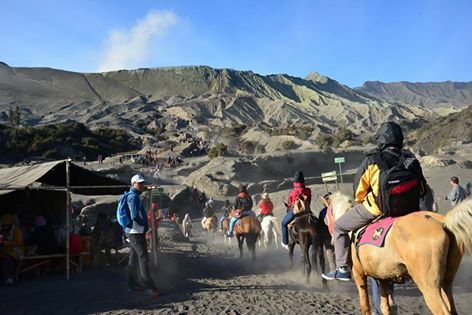 Mount Bromo become a favorite destination of local tourists and foreign tourist at this time as the natural attractions of active volcanoes. But for foreign tourists visiting Indonesia especially in East Java will simultaneously combine tourist destination to Mount Bromo and Ijen crater blue fire that became an international tourist destination. Wake up early morning,breakfast and then continues trekking to Kalimati (2,700 m asl) and then up to Arcapada. Ranu Kumbolo – Kalimati is about 10 km, about 2 – 3 hours walking. Kalimati is an open grassland on the foot of mount semeru. Then continue to Arcapada, the road is steeper. The whole trekking ranu kumbolo – arcopodo around 6 hours walk. Stay overnight in tent at arcopodo. At midnight wake up and then continues climbing toward mount semeru summit start at 02.00 am, normally we need 3 – 4 hours trekking (the road is very steep climb and sandy sometimes with avalance, the land is fragile here) your need for very carefully. Enjoy the atmosphere and beauty sunrise at ranu kumbolo, After breakfast then walk back 3 – 4 hrs to Ranupane village. From Ranupane we will picked up and tranfered to hotel in Bromo. Arrive in Bromo Hotel check in and free program. Morning call at 03.00 AM, start your journey in bromo area started at 03.30 AM pick up from hotel with jeep 4WD to enjoy the beauty of nature and the splendid sunrise at Mt. Penanjakan. After finish enjoying sunrise from pananjakan then proceed to Bromo crater through the sea of sand. After finish trip in bromo back to hotel , breakfast and taking a bath in hotel. Leaving bromo toward located hotel in Ijen with durations trip around 4-5 hours driving. Stay overnight at hotel ijen,free program. Early morning chek out hotel and depart to Mt. Ijen. Duration trip to paltuding post from hotel around 30-45 minutes. Arrive at paltuding continued hiking to mount ijen with a distance of 3 km for 2 hours climb. Reached the top of Mount Ijen then you free enjoy the beauty of Ijen crater lake, blue fire and sulfur miners activities. After finish back to paltuding then drop to surabaya or ketapang harbour or bali island. Tour ended. Semeru Bromo Ijen Crater Tour 6 Days 5 Nights, destination trip volcano in east java,mountain semeru summit,mount bromo sunrise and ijen crater blue fire in java island indonesia.